Note 1: I have been to several countries, but never have I driven a vehicle outside India until now. Note 2: Caution - speed bump ahead. This is a rant by an average Indian lost in the roads of a foreign land. If you are a holder of an Indian driver's license (international or not), and are employed by an American company, you are allowed to drive on American roads. You shouldn't be. Here's why. You have to drive on the right side of the road! Now, one might think it isn't that much of a big deal, right? Wrong! When you are driving on an expressway (more on that later), it is okay, you have to keep straight. The trouble begins when you are at a crossing, and you have to turn left. Pardon me, I am bad at drawing. But you do get the idea, right? And ALL the driving instincts that you developed back at home will force you to turn the car into the wrong side of the road! Inside American cars, everything is a mirror-image of how everything is placed inside Indian cars. The driving wheel is on the left instead of right, for example. I mean, of course this isn't as life threatening as turning into the wrong side of the road, but you do end up being taken aback when while trying to turn on the indicator, you end up switching on the wiper instead! And if this wasn't enough, enter automatic-transmission. Yes, yes, there are those kinds in India too, but how many? Automatic-transmission cars have only two pedals that you need to operate, accelerator and brake. And you can get accelerator to work only by first hitting the brake! Aaaah, kill me! In India, we have been brought up to think that we should be driving on the middle of the road. Like Kings. Well, that wouldn't go too well here. You don't have to drive over the dotted white line on the road, but between the lines! "Keep to your own lane", is the motto on the road. And, if you really must change lanes, you need to flash the indicator, look into the three rear-view mirrors, then actually look back to confirm that there is no-one just behind you because of the blind-spot in the rear-view mirrors, and then gradually change lanes! All this while keeping an eye on the speed so you don't cross the limit. Goodness! And even the gradual shifting is difficult because we are accustomed only to 90° turns, not changing lanes when we have to go straight! Who changes lanes going straight?! And then there are expressways. High-speed roads which connect long distances. You can get on or get off an expressway by taking the ramp or the exit respectively. Speed limits. Speed limits on these expressways are typically in the range of 60 mph (96.5 kmph) to 75 mph (120 kmph). Funny thing about the speed-limit is that it isn't so much the limit on the speed, as it is the speed you are expected to drive! 50 mph, and you are going too slow (and have cars overtake you left and right!). Plus, you can push it to 65 mph on a 60 mph limit. So much that the cars on an expressway are more-or-less at a zero relative velocity to each other. (Yes, the concepts of uniform motion you learnt in school come-in handy.) Which also means that you can change lanes if there is no-one to your left or right, irrespective of someone being in front of you or behind you, a concept which takes a LOT of getting used to. The savior, of course, is the GPS. Without it, you are lost in the concrete jungle. Except, when the GPS goes on harping, "Take EXIT! Take EXIT! ", and you see no exit! "Ah, there it was. ", you would go, right after you've missed it. And do not worry if you miss an exit. Your loyal siri-like GPS would "recalculate" the route for you, and ask you to take the next exit, provided you see it of course. All this, is of course easier than following instructions such as - "Turn right, and then keep left on highway XYZ". Turn right and then keep left?! Yes, 'cause if you don't, the road branching on the right will take you some place else! Yes, and then there are "Right only", "Must exit", "Left only" lanes. And if by the grace of God you land up on a "Right only" lane by mistake, turn right, no matter what. No stop, reverse, get-on-the-right-track for this country. And finally, the Stop Sign. A marvel of traffic engineering, something that is NEVER going to work in India. When you see a stop sign, you stop. 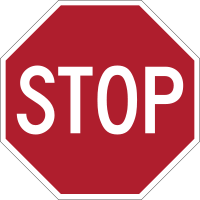 Stop, stop, stop. And the one who arrived at the stop sign first, gets to go first! I arrive at a stop sign, and every time, every single time, I marvel at the civility with which people stop, and then wait for everyone who arrived before them to go, and then go their own way. I can NEVER imagine something like this working in India, because here, the one who can go first, goes first. Everywhere. Note 2: No-one needs to sell this trilogy to anyone, and this post doesn't attempt to. This, is a long personal rant about the almost religious experience I had. 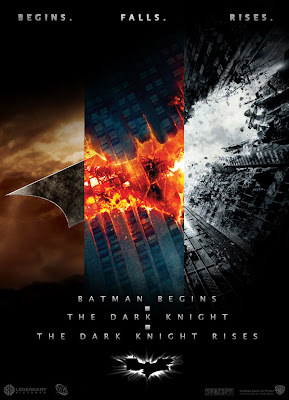 Tip: Do watch 'Batman Begins' again before watching TDKR. Ah, and I have marked the TDKR spoilers. When a forest grows too wild, a purging fire is inevitable and natural. Beginning is the end of the beginning. A storm is coming. Let's say our caped crusader failed to prevent Ra's Al Ghul from releasing the toxin in the entire city, and Gotham was really torn apart. Out of it would have been born a new Gotham, like how a Phoenix rises from its ashes. This theme is reminiscent of Necessary Evil in 'Watchmen', or the destruction of Zion following the occurrence of the anomaly in 'The Matrix trilogy'. Assuming this to be the natural cycle of things - creation, sustenance, and eventual destruction, this makes Ra's Al Ghul (or, the League of Shadows) the hero of our story, and Batman, the anti-hero. Of course, Batman saves the day before the people of Gotham collapse their city due to the toxin-induced fear and panic. Fear, or overcoming fear, is the most explicit and loudest theme in 'Begins'. What does overcoming fear mean? Does it mean the absence of our fears altogether, or does it mean channelizing it, and turning it against the ones we want to fight? And what do we really fear? Death? Ourselves? And love? Do we fear love because we don't understand it, and because of the grief and pain that it causes? That impossible anger strangling the grief, until the memory of your loved one is just... poison in your veins. Enter Joker - "Mind if I cut in?". What follows is total, absolute chaos. Joker pushes Batman to his limits, like he had been never before, and Gotham is engulfed in anarchy. Every action will have a reaction, and the harder you hit, the harder you will be hit. This is how crazy Batman's made Gotham. Continuing the hypothesis about Begins, Gotham must burn, and Gotham is presented with Joker this time, an agent of chaos. Batman has to face something which he cannot match. With Joker, there is Nothing Out There which could be used to threaten him with. Nothing to do with all of Batman's strength. The knight is darkest just before the dawn. You know the thing about chaos? It's fair. Bane is Gotham's Reckoning. Following the events that happened in Begins, Bane is a mercenary who leads an Underground Army to fulfill Ra's Al Ghul's destiny. It has been 8 years since Batman took the fall for Harvey Dent, a figure Gotham now worships, and Batman, declared an outlaw. Gotham's rebuilding is based on a lie, which puts Gotham On Thin Ice and threatens to shake the very foundations it stands on. Batman is not broken mentally this time, he is broken physically. This is pure adrenalin-fueled muscle-fight. This is not an unstoppable force meeting an immovable object, this is the meeting of two unstoppable forces. And Gotham really burns as The Fire Rises. This movie is about facing your demons. Accepting them, and making your peace with them. Is Gotham really beyond saving? Batman's fears come back to haunt him as he hits the lowest point in his life, literally. The sequence about fear being essential quality for life, and it being the emotion that gives you the impulse in the single moment when it really matters, is mind-numbing. Is it fear that makes us love? Or love, that makes us afraid? Batman must learn to be afraid again, and Batman must learn to love again. Batman must learn to let go, because Fear will Find You. Batman must remember how it felt like when he was really afraid. And Batman must remember how it felt like when he was truly in love. He must Imagine the Fire that once burned within him, and made him. And it is fear, and love, which saves Batman, and ultimately, Gotham. I feel so happy that the 'pit' sequences were filmed in India! It is the moment of truth for Batman in the entire series. And you cannot help but cheer our (un)masked hero when he, Rises. The people's court sequences are neatly executed, and Death By Exile masterfully crafted. The movie also brings the story to a full circle as John Blake, a Gotham police officer, Born in Darkness, someone who shares a story similar to Batman's childood, rises in the Bat cave. If you like hot women riding bikes, and if you loved Carrie-Anne Moss riding a Ducati in 'Matrix Reloaded', or if you loved Angelina Jolie in the motorcycle chase in 'Tomb Raider', wait till you see Anne Hathaway riding the Batpod! O. My. God. ♥ And goodness the moment when Catwoman goes "Don't be shy"! Anne Hathaway adds delicious sparks to the already spectacular fireworks. And of course, this would be incomplete if Hans Zimmer's brilliant score spanning the complete trilogy isn't mentioned. He does well to maintain the grim, dark, and Despair consistently. 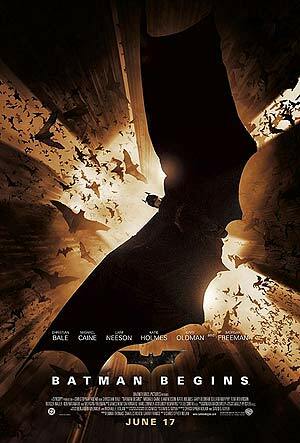 This movie makes 'Batman Begins' the most important film in the trilogy. 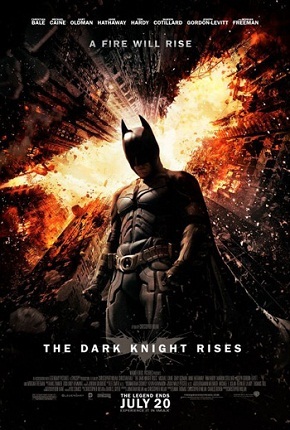 'Rises' is a fitting conclusion to a brilliant trilogy. Dey-shey bah-sur-rah. Rise. The trilogy is epic, almost operatic. Batman, a romantic, tragic hero. There are people and critics who go all "Rises isn't as good as the second movie." Newsflash - there isn't a second or a third movie! This is one story, told in three parts. And I find a lot of people saying that old characters weren't given enough space, and that there were too many new characters introduced. Well, I don't think that there was any other way to end the story fittingly. Compare it to a Shakespearean tragedy, where the climax happens in Act. III, new characters introduced in Act. IV, and Act. V is wrapping up of sorts. Would it be fair to say that Act. V lacked wherein Act. III excelled? Each part has it's own role to play in the big picture, the grand story. 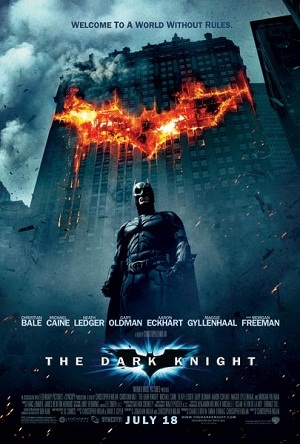 And Nolan did right in selling this movie as the "conclusion" to the Dark Knight story. Nolan got the world eagerly waiting for the final installment, and I haven't been this excited about a movie is a looong time. rottentomatoes had to ban comments on TDKR reviews for a few days, and imdb is still awaiting "5 votes" before releasing the ratings. Now that's something! "This is it. ", says Nolan about his future involvement with DC properties related to the Batman. But he did end the movie in a way the movie studio could exploit in their future outings with the Batman. Joseph Gordon-Levitt would most certainly make a good Batman. 'Justice league' movie has already been announced. 'Man of Steel' releases next year. From the trailer and the information released so far, it deals with a young Superman's coming-of-age story. It would then hardly be a surprise if 'Man of Steel', 'Justice League', and the Batman "reboot" slated for 2015 are set in the same movie universe as this. You don't owe these people any more. You've given them, everything. IMAX is truly the movie format of/for the future. If 'Avatar' was the flag-bearer for 3D motion pictures, then 'The Dark Knight Rises' most certainly is for IMAX. With over 70 minutes of footage shot using IMAX cameras on its proprietary 70 mm film, this is the first major full-length motion picture to achieve this. Having watched a lot of 3D movies recently, and regretting it, IMAX cannot disappoint by design. While you can pick and choose which scenes to shoot in IMAX, the complete movie has to be in 3D, an inherent flaw. I can only imagine how much more gorgeous 'Avatar' would have looked had it been shot on IMAX. When the scenes in 'Rises' switch to those shot on IMAX, you are suspended in a moment of disbelief and awe, as you are presented with truly breathtaking imagery. The official IMAX logo gets it right, you have to see it to believe it. The format of the future definitely needs to extend, 3D just got the dimension wrong!